Topical Aromatic Essential Oils: Supportive? Today’s post will hopefully shed some light on a topic that is beginning to creep into some conversations regarding essential oils classified as “cosmetic.” Essential oils that are stated for use as “topical/aromatic” are classified as cosmetic. Click/Touch here to visit the web page where you can find this definition. This means that claims cannot be made that imply/state a physiological effect on the human body. For example, a claim such as, “supports a healthy immune system” implies the product will have a physiological effect on one’s healthy immune system. What is a physiological effect? How do I know Young Living agrees with this and is telling us to not make structure-function claims for essential oils classified as topical/aromatic? If you do not want to hop on over to your virtual office to obtain the PDF version of the “General Topical and Aromatic Claims” document posted by Young Living, you can click/touch here to download this document to your device. So, now that you have your head spinning your probably wondering what you CAN say about topical/aromatic essential oils? Young Living has developed (and is continuing to develop) a list of approved claims for each of their oils, including those classified as topical/aromatic. This list is updated each week and can be found in Young Living members virtual office (U.S. Members, other countries? Please check your virtual office to see if you have one posted, if not, contact Young Living to enquire about having one placed in your virtual office). Click/Touch here to download the most recent (as of 12 July 2015) version of Young Living approved product claims. Any essential oils classified as topical/aromatic (cosmetic) cannot be discussed in the same way as those classified as dietary supplements. Meaning, any oil classified as topical/aromatic cannot be used with structure-function claims (such as, supports a healthy immune system or supports a healthy respiratory system). Making the air smell better. Not sure which oils are classified as topical/aromatic? Click/Touch here to view a list of those oils. We hope this helps clear some/most of the confusion surrounding topical/aromatic essential oils. If you have further questions/comments about this topic, please contact Young Living’s Conduct and Education Department via email conduct at young living dot com. We purposely typed the email this way to help keep “spam bots” from obtaining the address. This entry was posted in Compliance, Essential Oils and tagged Aromatic, Compliance, Cosmetics, Essential oils, The Oil Posse Team, Topical, Young Living on July 12, 2015 by Jordyn Lei. Classifications, you say! What’s up with that? Important Note: The information provided here is not necessarily the views of Young Living. This is written by an Independent Representative of Young Living. Written by: Aimee Watson (formerly Amy White Moore, M.S. 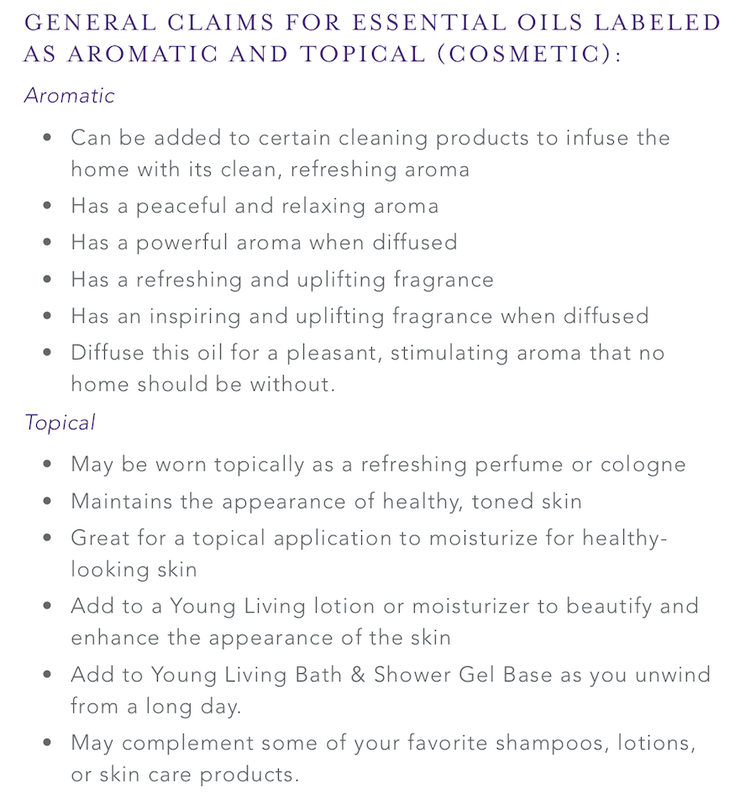 This entry was posted in Compliance, Essential Oils, Tutorial and tagged Aromatic, Beauty, Classifications, Compliance, Cosmetic, Dietary, Dietary Supplements, Essential oils, Topical, Young Living on June 13, 2015 by Jordyn Lei.